Goodness. It's been quite some time since I've posted anything here! I'll blame it on the summer -- despite Dr. Whisky's excellent warm-weather dramming advice, I've been in gin and tonic mode for the past few months. Now that autumn is upon us, let's get back in the swing of things with a very popular bottle that we're all very familiar with. I've mentioned before that I was never a big fan of Johnnie Walker. I tried Black Label, and decided I didn't like blends. Then I tried Gold Label, and was unimpressed. Then my palate developed a little bit, as I branched out and tried different things. I decided to come back to Black Label one more time, and I'm glad I did. The funny thing is, it's not really all that great. It's got a caramel sweetness to it, in direct opposition to the light smoke and just a hint of peat. It's nice and creamy, and the smoke lingers in your mouth after you drink it. Which is all well and good, but as far as flavor profile goes, Black Bottle does all that better. 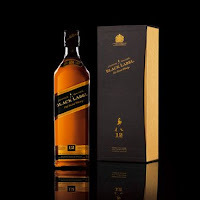 So what is it about Black Label that makes it so drinkable? It definitely has some ethereal quality that makes me want to drink more of it once my glass is empty. And no, it's not just the alcohol! Some virtue of the combination of smoke, spice, and sweetness in these exact proportions keeps me coming back, despite the fact that there are many drams that taste better. And I suppose that's a much more desirable quality than mere tastiness. P.S. I find that this is one of those rare Scotches that do not benefit at all from water. A few drops are okay, but don't dilute it. It just kills all enjoyment of the drink.